Mudd-Ox has been passionately founded upon the innovative application of leading-edge techniques, ideas and approaches that bring this class of vehicle firmly into the 21st century – able to excel in the most demanding of applications and roles. 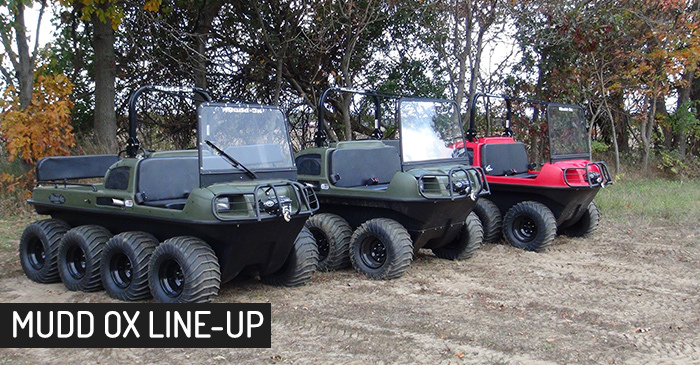 The convergence of youth and experience heralds the next chapter of Amphibious ATV development. Hydrostatic drives are central to the usability and sheer power of the Mudd-Ox range, the technology and basic principles of our hydrostatic drives and control system are explained in a bit more detail here. However the performance we demand of this machine relies on more than simply the best power transmission and control that we can provide. The hydrostatic family pulls together a range of clever design characteristics that come together to provide an overall level of performance, handling, durability and sheer unstoppability that is far more than the sum of its parts, setting a benchmark that few approach, let alone match. Power is supplied by either Briggs & Stratton Vanguard, Kohler Command, or Kawasaki twin-cylinder engines ranging from 480cc to 745cc, with petrol or diesel options available, all are covered by a two-year manufacturer warranty. Warranty and service work on the engines can be performed at any of thousands of authorized service centers across the U.S. and the world. Our Amphibious All Terrain Vehicles are a uniquely flexible class; they can carry up to eight passengers contained safely and comfortably within the body of the vehicle, protected from environmental extremes … they can do this on land, on water and on those more challenging terrains that are neither one nor the other – swamp, marsh, bogland, mud flats, the littoral, deep powder snow, places that man, nor boat, nor land vehicle can safely go. Standard features on all models include: Amphibious capability, electric start, CVT or hydrostatic transmission, headlights and tail-lights. Mudd-Ox variants sport a 10 gallon tank, supporting extremes of endurance in the more fuel-efficient turbo-diesel configurations, along with Hydrostatic transmission offering finger tip precision control without the need for gears. 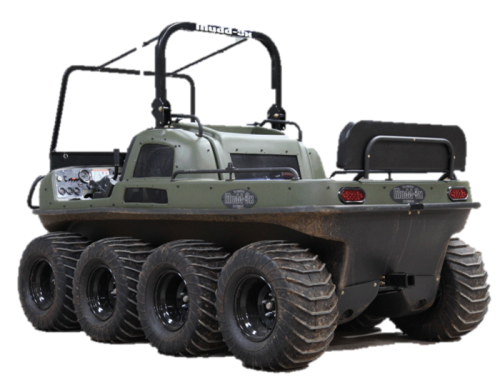 Clever chassis and transmission design allows us to achieve a central belly clearance of 12″ (30.48 cm) on 26″ Vendettas – far better than other Amphibious All Terrain Vehicles (AATVs) such as Argo and in a completely different class compared to Utility Task Vehicles (UTVs). Ground clearance is important since it reduces the risk of bellying out in soft, sucking mud or of becoming stuck when crossing rugged, irregular terrain (boulders, stumps etc), a particular concern when significant obstacles are submerged or encountered when negotiating blind ridges. Such obstacles are not simply a threat to mobility, but present a real opportunity to cause damage or endanger occupants when travelling at speed. Excellent ground clearance was a core design objective for good reason. Achieving it requires careful trade-off to maintain displacement volumes for flotation, stability and internal load space. Look carefully from the side and you may get the impression that the front and rear wheel-stations sit slightly higher than the middle pairs. They do, only slightly, but just enough. This design feature has two purposes, firstly it improves the stability and approach performance when encountering steep or step obstacles, secondly, when travelling on firm ground it marginally reduces the amount of drag on front and rear tire sets, significantly improving steering responsiveness and reducing drag-wear on the tires. Tracks are an important mobility enhancement for certain types of terrain and we have designed in the ability to fit them more easily, without the need to compromise on tire size. 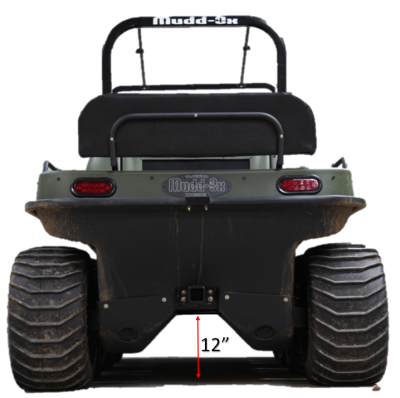 If you compare the current generation Mudd-Ox to its predecessor – or pretty much any other machine – you may also notice that the gap between the top of the tire and the body shell has increased, it has … not by much, but by precisely enough to allow you to run tracks on the 26″ Vendetta tire. Switching to a smaller tire size in order to fit tracks has never been a very good idea. Now there’s no need to. That solid-looking roll bar … is just that, and it comes as standard on all Mudd-Ox. Mudd-Ox roll over protection systems are chassis mounted, not simply bolted to the body shell, whilst smaller, lighter machines employed in less demanding environments may get away with such solutions we do not regard safety as being a compromise worth taking. Our safety provisions set the benchmark in medium to high range machines. Whilst we set and claim the highest standards with some pride, the shortcomings of other machines in this area do not give us any satisfaction. So, what are the compromises? Not many at all; it costs a little more to build, it was harder to design and that’s about it. In terms of advantages though, we achieve a stiffer, stronger structure, we have an additional ‘hard point’ able to support all manner of uses, such as winch, jib or rack mounting. Indeed it is strong enough – as you would expect – to support the full weight of the machine, and then some. Emergency helicopter underslung lift using only a strop – not a problem – you can lift the machine from the roll bar … if you wish. And of course you can fold it for transportation or to access … small places. Our tires are described in detail here. We designed our own tire because the solutions available were undermining the quality, performance, handling and ride of the machine we wanted to build. With the help of Hoosier and no small amount of experience we have a solution that we can be proud of. And we are. When you start to bring these little bits of innovation together, magic happens. Over forthcoming weeks we shall begin to elaborate; to explain implications from a user perspective, to provide some hints and tips on how to get the very best out of your Mudd-Ox, what to look out for, what to avoid … because the biggest bit of magic happens when you sit in that seat and take control; the better you are the more effectively you will be able to exploit our clever design. Two newly enhanced body shapes were released during July 2013, and one was developed in 2015. The updated base model (GT) retains the familiar, sophisticated look and feel, but with some adjustments to body-wheel clearances that will allow larger 26” tires to be used with tracks. From a performance perspective this allows the GT to transition between tracked and untracked use without the significant degradation in cross terrain capability associated with smaller wheels, improving flotation with tracks fitted and eliminating the need for additional wheel-sets when switching between tracked and wheeled use. At first glance the brand new (XL) is not very different to the GT, however set side-by-side the differences are easier to spot. The XL body is 6”/150mm longer and wider and the upper body rim sits marginally higher. The new body-shape significantly enhances cargo capacity, and improves water handling with better flotation and stability. The third model is called the Mudd Ox Fort Mac Edition. Originally designed for the Oil Sands in Fort MacMurray in Alberta Canada, we have made these tough and versatile machines available to the public.